All the new creative features and specs in Apple's iOS 11.
iOS 11 has been released in beta for iPads, iPad Pros and iPhones, with the full version expected to drop as soon as Wednesday, September 13 (after the launch of the iPhone 8 on Tuesday). So what key features does Apple's new mobile OS bring for creative professionals? This roundup aims to bring you the latest news, rumours, full release dates and specs of iOS 11 for designers, to help you know what to expect. How can I get iOS 11? iOS 11 is already available as a public beta – so you can download it right now to your iPad or iPhone. To do this, you’ll need to sign up to the (free) Apple Beta Software Program. Once you’ve done this, you install a profile to your device and download the beta. You should back up your device first using iCloud or iTunes – but don’t worry, you can go back to iOS 10 at any point if you need to (although you will need to reset your device first). What’s great about iOS 11 for designers? 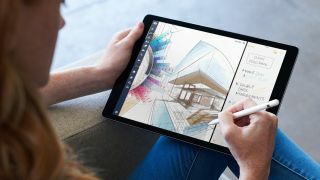 Apple's iPad Pro has brought designers, artists and motion pros a brilliant mix of power and portability, with the excellent Apple Pencil also offering a way to sketch out ideas with a huge amount of precision. But its original iOS still felt like an operating system for phones and tablets – not for serious professional work. iOS 11 transforms the iPad into a serious productivity tool for creative professionals through a number of very cool features. Possibly the most interesting of these is the new Files app. Yep, it sounds a tad dull, but it means you now can easily save, browse and manage all of your files on your iPad – plus those in apps, on your other iOS devices, on iCloud Drive and cloud services such as Dropbox and, most excellently, Adobe Creative Cloud. The latter means you have access to your work, wherever you are, without even having to launch Adobe’s mobile apps. You can tag your files and folders as well – just like on macOS. The next great thing is multitasking. Yes, there has been multitasking functionality in previous versions of iOS, but iOS 11 takes it up to, er, 11! You can still run a couple of apps at once using the Split View (two apps running side-by-side) and Slide Over (two apps running with one in a floating window), as introduced in iOS 9. There are slightly different ways of launching these, and you can now add a third app on an iPad Pro. But the introduction of drag and drop is a real game-changer for creatives. We know, it sounds so simple, but drag and drop is what the iPad has been missing for so long. So now when you have two apps open you can drag say, an image from one of your creative apps to your email easily. This used to be a matter of sharing from your creative app. It’s much easier now – and the new Dock, now available from any screen – echoes that in macOS. Many apps will be updated to support iOS 11's drag and drop functionality, including Adobe’s mobile apps, the ace Procreate and Morpholio Trace. Essentially, with this release, iOS is closer to macOS than ever before. And that’s obviously a great thing (maybe we’re one step closer to a Surface Book-like Apple laptop – we can dream, can’t we?). What’s new with Apple Pencil? If you’ve got an iPad Pro and Apple Pencil (after all, the Apple Pencil won’t work with other iPad models), iOS 11 brings some interesting new updates to the sublime stylus's abilities. For example, Instant Notes gives you the ability to simply start drawing on your lock screen, with the sketch or note automatically then appearing in the Notes app – great if you need to quickly capture an idea. And marking up PDF files is just as easy – you don’t need to select any kind of tools, just start drawing. The same goes for sketching within emails. The Apple Pencil hardware remains the same, but the way iOS 11 works with it has been greatly improved. What else is new in iOS 11? There’s a few other things that designers may use – including the built-in document scanner (good for contracts) and a better keyboard. But the most exciting other introduction is ARKit. ARKit is Apple's new platform for developers to help them bring high-quality augmented reality (AR) experiences to iPhone and iPad using the built-in camera, processors, and motion sensors in iOS devices. According to Apple, ARKit enables developers to tap into the latest computer vision technologies to build detailed and compelling virtual content on top of real-world scenes for interactive gaming, immersive shopping experiences, industrial design and more. We’re yet to see what it can do properly, but it’s a hugely exciting development that could open up a new world – literally – for apps and how they interact with the world around us. What about for my iPhone? Aside from the Apple Pencil functionality, pretty much everything else is the same on iPhone as it is on iPad. But you obviously use your devices in different ways. For photography nuts, the new pro filters in the Camera app will more than suffice, and Live Photos get a bit of a revamp as well. As well as being able to create a short motion clip with Live Photos, you can now create a loop effect, a bounce effect – making your photos rock back-and-forth – and a Long Exposure. The latter will be brilliant for capturing night time inspiration, we reckon. What do I need to run iOS 11? You’ll need a relatively new iPad or iPhone to get the most out of iOS 11. Apple says you’ll need at least an iPad Mini 2 or iPhone 5s. Of course, anything newer than this will make the OS run a lot smoother. And to use Apple Pencil you’ll need an iPad Pro 9.7-, 10.5- or 12.9-inch. If the rumours are true then the iPhone 8 and iPad Pro 2 could be announced before the official release date of iOS 11.